From 2009 to 2012 the Botanical Garden in Copenhagen has been transformed, and now it appears more beautiful and attractive than ever before. Thanks to a donation of DKK 17 million from A.P. Møller and Chastine Mc-Kinney Møller’s Foundation for General Purposes, The Natural History Museum has been able to renovate and renew the old garden. The newly renovated garden is officially inaugurated today at two p.m. The inauguration will take place near the Palm House in the Botanical Garden. Photo: People are having a good time at the new wooden wharf on the lake shore. In connection with the renovation the Botanical Garden has been made more user-friendly and has been expanded by 10,000 square metres as the Observatory Hill, which is the highest point of the inner city, has been included in the garden. All the paths have been renovated, and several recreational areas have been added to the Botanical Garden as well as new irrigation systems, greenhouses for teaching and a small wooden wharf by the lake. 1874 and with great respect for the special nature of the site. The renovation has been overseen by landscape architect Jens Hendeliowitz who, among other things, is known for the renovation of the palace gardens of Fredensborg and Frederiksborg and the King's Garden in Copenhagen. "The Botanical Garden is a green oasis of peace and contemplation where you can enjoy the special atmosphere and expand your knowledge of the plant kingdom. With the renovation of the garden, plants have the best conditions to live and grow, and guests have a more welcoming garden offering a break in beautiful surroundings in the middle of the bustling city," says Morten Meldgaard, director of the Natural History Museum. 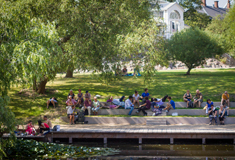 The Botanical Garden, which is also a part of the University of Copenhagen, functions as a garden for public outreach, teaching and research, and with its approx. 9,000 different plant species it represents the largest living plant collection in Denmark. The unique collection has made the garden famous outside Denmark, and due to the renovation of the old garden, there now exists optimal conditions for preserving the collections and the special atmosphere for which the Botanical Garden is also known. a lifelong fascination of nature is planted. "The generous donation from A.P. Møller and Chastine Mc-Kinney Møller’s Foundation for General Purposes has made an extensive renovation and refurbishment of the Botanical Garden possible. The beautiful new garden is a unique oasis in the big city which can arouse interest in plant life, nature and science. It is about expanding the concept of education throughout the educational system to also include the natural sciences," says Ralf Hemmingsen, Rector of the University of Copenhagen. A sterling garden. Discreet materials that age gracefully characterize the renovation of the Botanical Garden. For example, coating materials on the paths and squares are simple and made almost entirely of natural materials such as gravel and granite. New pergolas and espaliers along the lake and in the Perennial Quarter have been made of glass blown stainless steel which is maintenance-free and discreetly designed so that the plants are brought into focus. Newly built paths. The new coating on all paths improves the accessibility significantly for people with disabilities. It is now possible for wheelchair users to get up to the top of the rock gardens, and new coatings of granite border stones in both the Perennial Quarter and the Danish Quarter mean that disabled and wheelchair users can now get close to all plants. The area around the basin below the Palm House has also been resurfaced and expanded so that events such as low key concerts may take place here in the future. Moreover the paths that lead up to the Palm House have been restored to their romantic curved course as in H.A. Flindt's original garden plan from 1874. The Observatory Hill. The highest point of the Inner City is the Observatory Hill which has become part of the Botanical Garden. The garden now has a third entrance from which you can go up the Observatory Hill and back down to the garden by following a new granite staircase. On the Observatory Hill the original lines of sight have also been restored so that you can get a good view of the garden on one side and of the inner city with its many towers and spires on the other side. School classes, kindergartens and other guests are free to use the lawn around the observatory for education purposes, breaks and picnics. The Blackberry Garden. A new area has been named the Blackberry Garden. Here visitors will now be able to experience the fine collection of blackberries and peonies. The Blackberry Garden will offer activities for children and be used for teaching school classes in the old greenhouses. Environment-friendly watering. A new automatic irrigation system has been established throughout the garden. This means that the plants can be watered at night when evaporation is less. It saves on water resources. Also the drainage of paths and squares has been improved for the benefit of the environment. Most of the rainwater is conducted to plant and pasture areas and to a lesser extent to the gullies. Hereby rain water is absorbed and used by the plants instead of being conducted into the sewers. A place for peace and quiet. In the future, the public will be able to enjoy even more the garden's beautiful vistas and the tranquillity the garden offers in the midst of the bustling city. At selected locations you may sit on the grass or on the renovated benches, and a small "wharf" has been established by the lake in the middle of the garden. Here you can experience lectures and events under the open sky or take a rest overlooking the lake. A wealth of plants. The Perennial Quarter is one of the quarters that have been significantly changed. Pergolas are renovated, and new espaliers have been set up. Beds that used to be angular are now softly rounded, and new benches invite guests to sit down and enjoy the romantic atmosphere. Also the Danish Quarter has become a unique area where you can explore the Danish plant kingdom in miniature. Here you will find all Danish species, and in a newly established bog biotope you can experience amongst others wild orchids and carnivorous plants at springtime and during the summer. To the delight of the public. The entrance area near Nørreport Station has been widened and is now more welcoming to the public. The Botanical Garden Shop has been relocated to a small, red-brick listed building, and the entrance area has been redone to allow more space for groups and school classes to use the area as a meeting place. The Botanical Garden in Copenhagen is a part of The Natural History Museum of Denmark, University of Copenhagen. All photos on this webpage may be used in connection to press coverage of this story. Click on the images to see them in full size. Birgitte Rubæk is the photographer if nothing else is stated. Please, credit the photographer and The Natural History Museum of Denmark.